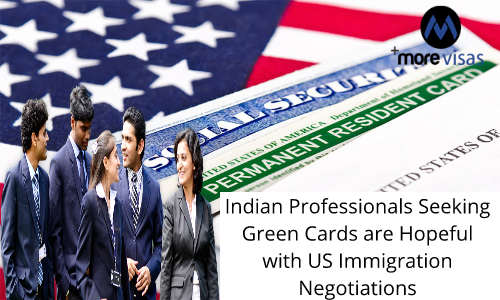 Negotiations for an ambitious immigration deal are underway in the US Senate, for determining the future, of an estimated 1.5 million Indians, having H-1B visas, who wait in the queue to receive their Green Cards. Their cases are expected to be an important element of the deal, which is working for determining the future of 690,000 undocumented immigrants, who had arrived in the US as children. The deal is in response to a demand by President Trump, for a wall along the Mexican border, ending the diversity visa lottery, and family chain migration. The Senate had passed it with 97-1 voted to commence the debate which will feature proposals composed by senators in their individual capacity or in groups. Some Senators are also trying to have bipartisan support. Another bill, which was introduced in January by Orrin Hatch and Jeff Flake, Republican senators, known as the Immigration Innovation Act of 2018, aims to address the backlogs issue, through the removal of the annual country cap, and also to cut the waiting period for Green Cards for Indians. The present backlogs would take around 70 years to clear. Senator Flake proposes a compromise bill that includes Trump’s plan, and other issues like H-1B visas, Green Cards and removal of the country cap. This has created a wave of excitement among the Indian community. Experts feel that some good news and compromises, including removing the country limits, are expected to come out soon. Negotiations will continue till one of the competing legislation, in the Senate collects the support of 60 of the 100 members. The next stage is the House of Representatives, which will decide, discuss and vote on the bill. Immigration is a discordant political issue in the US, and in spite of the need for reformation; Congress has failed to legislate on it in the past three decades. In 2013, the House ignored a Comprehensive Reform Bill, which was passed with bipartisan support in the Senate.